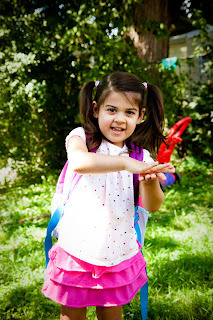 Inara started her first day of school yesterday. She's in Pre-Kindergarten at a wonderful school, and I can't quite believe that my firstborn baby is already at this huge milestone in her life. I bet she'll be asking me for a smartphone and a hybrid car tomorrow. Slow down, time!!! Sheesh. Anyway, I wanted to thank everyone - friends and acquaintances and internet people who I haven't met in real life too - everyone who emailed me, called, texted and left comments here and there and everywhere. I don't think I could have gotten through the day without all that encouragement and support. So thank you, from the bottom of my heart. Thank you for being there. 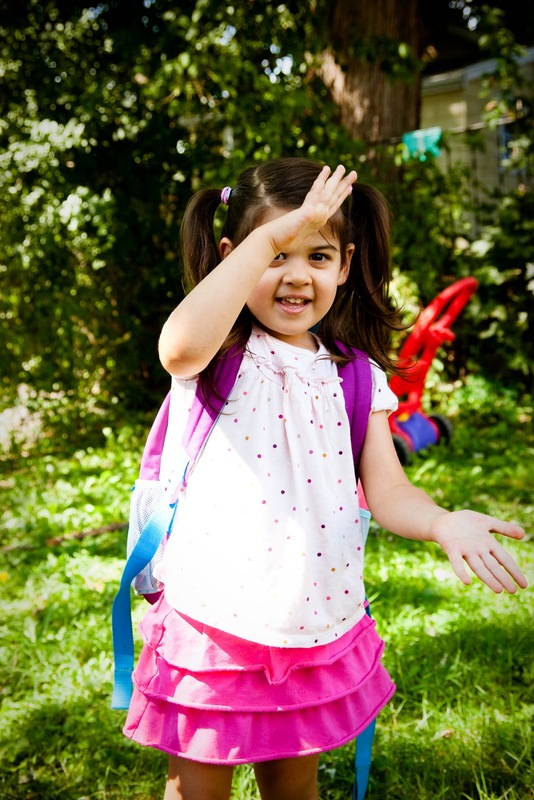 Surprisingly, we weren't the only ones who showed up to The First Day of Pre-K with the whole family in tow, nor were we the only ones who showed up with photo gear. We were however, the only family who had MULTIPLE cameras (one also shoots video), a screaming baby that needed a nap like nobody's business, and a big girl who could read (which made for interesting conversation, indeed - when other parents would say, "I think I'm going to G-O", she'd get all antsy - "WHAT? You can't GO yet!?! Did you hear that, Ruby? Your Mama said she's going to GO!!!"). Go figure. But - for a smart and sensitive little girl who has never been in daycare or preschool, I think Inara did wonderfully well. 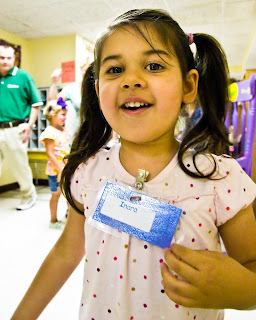 She did ask if I could stay with her, and the teacher was happy to accommodate a parent volunteer, so I did stay. I mostly helped other kids and I think it was enough for Inara to know that I was somewhere around, even if she couldn't always see me. I definitely think that there is going to be a period of adjustment for both her and I, but I know that we can do it - together. 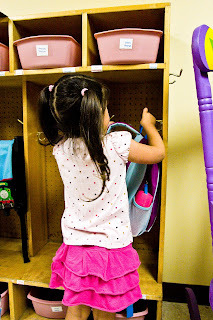 She loved interacting with other kids one-on-one, and is looking forward to trying out all the new toys and books and activities that she didn't get a chance to use yesterday. While I was watching her in class yesterday, there were so many times that I would be struck with manic happiness, or incredible sorrow and guilt. I was SO happy that she was in school, meeting other kids and learning about her world in new ways, but I also felt so sad about the fact that one day soon, she'll be spending most of her day away from me. There was a hilarious little boy in Inara's class that kept telling the most creative jokes - and I was so thankful to be there to be able to see Inara "get it". I kept thinking about all the things that she would eventually tell me about when she came home from school...and for each of the things she did tell me about, I wondered how many things she'd forget or file away or simply deem not important to share. It honestly made me a little sad to know that there would be things I'd not be sharing with her...but at the same time, I'm beginning to realize that I so want her to experience the world through her own eyes, and to decide for herself the things that she likes, dislikes, and wants to share with me. I think I'm going to have to grow up a little bit myself as well - I'm going to have to put on my Big Girl Momma Pants and let her live her own story. But, I am always going to be the one that she comes home to and shares it with. I can't wait to share it with her. 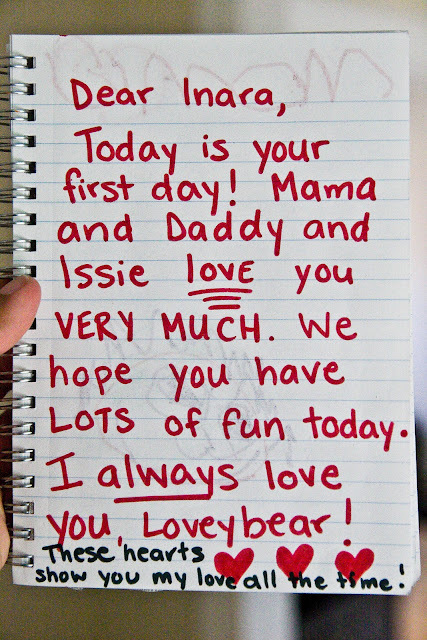 One of the things we did as a family to get Inara prepared for school was start a "feelings notebook". One of my amazing and thoughtful friends suggested it to me, and I can't wait to share more about it with you next week. 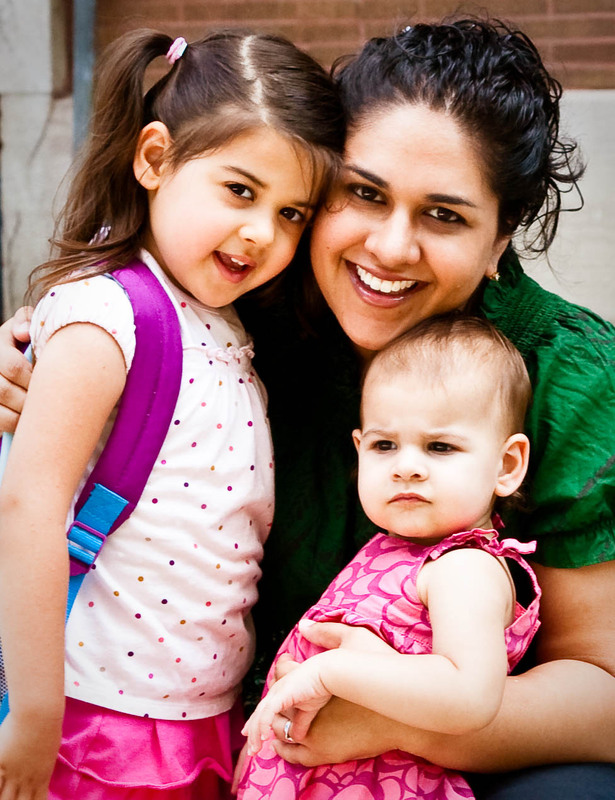 I think it's been a great way for us to talk about school and all of Inara's concerns in a very real and validating way, and I also think it really did help Inara to know what to expect. We visited her teacher the day before school started, and Inara read from her "Favorite School Book" (which is what she decided she would call it - I have no idea why, but we're going with it) - her teacher was blown away, and was kind enough to take the time to talk with Inara about each of her feelings. It cemented their bond and made Inara feel much more comfortable. I am so thankful for that too. I'll stop here for now - and share some pictures (because I know that's what you're really here for,...who wants to hear an overly-emotional Mama prattle on endlessly, anyway! I really need to get a grip sometimes). Thanks again for being a part of this big day with us, everyone. 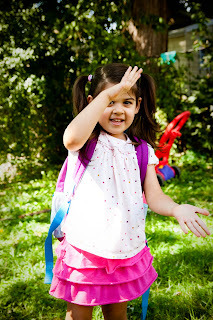 Afterward - we rode home and she had to tell Daddy all about "The Kissing Hand", a fantastic book that is so great to calm those first day jitters! 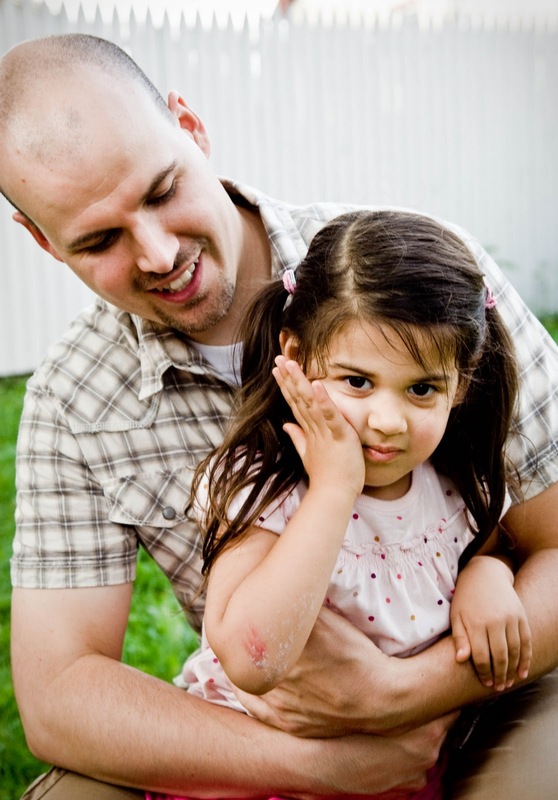 Loving that Kissing Hand (and her Daddy) - I personally love that first-day schmutz on her elbow. We love you so much, Nan. I know this is going to be just the start of so many amazing things for you. Happy First Day, love! You did it!